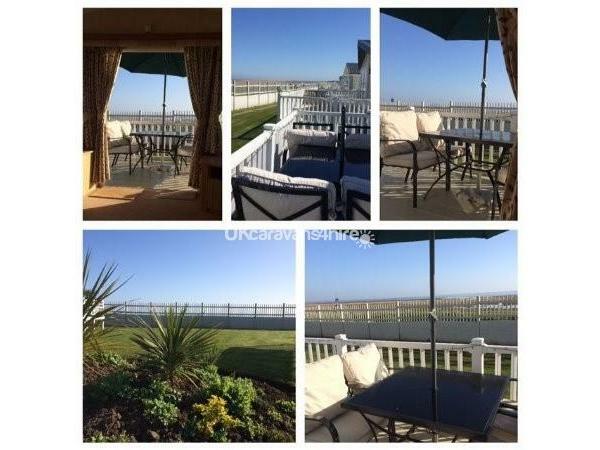 THE BEST LOCATION OVER LOOKING THE SEA on Thorpe Park, Cleethorpes. This superb centrally heated caravan has patio doors leading onto a lovely balcony where you can eat al-fresco style or just relax and enjoy the view. For further information and a detailed description of what is included, please see holiday home and location section below. Book early to avoid disappointment. Contact Monica on 07971374646, email palmsprings51@hotmail.com or you can use the enquiry form below. The spacious living room has a 3 seater bed settee and a 2 seater settee, along with a 32" flat screen TV, Freeview and a Blu-ray/DVD player. There are also a variety of DVDs, family board games and activities for you and your family to enjoy. 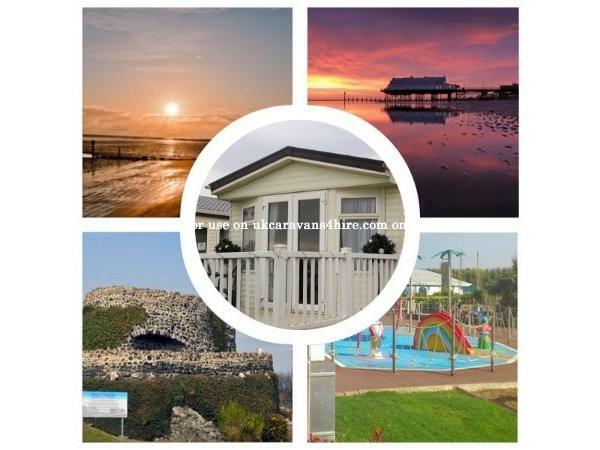 Exclusively located on the top class Thorpe Park, right in front of a pretty sandy beach, this lovely caravan offers all the comforts and luxuries you would expect for that perfect holiday or short break. It is beautifully furnished in a light and modern style with a spacious open plan living area. The modern kitchen is fully fitted and properly equipped with everything you need; there is also a separate dining area with a table and seating for 6. 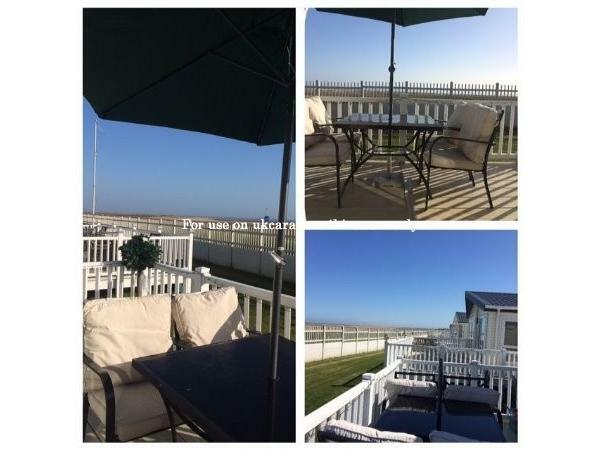 Exclusively located on the top class Thorpe Park caravan site in Cleethorpes, right in front of a pretty sandy beach, this extra wide caravan offers all the comforts and luxuries you would expect for that perfect holiday or short break. It is furnished in a light and modern style with a spacious open plan living area. The modern kitchen is fully fitted and properly equipped with everything you need; there is also a separate dining area with a table and seating for 6. The spacious living room has a 3 seater settee and 2 seater bed settee, along with a 32" flat screen TV, Freeview and a Blu-ray/DVD player. There's also a variety of DVDs, family board games and activities for you and your family to enjoy. The double bedroom has plenty of wardrobe and storage space. The twin bedroom is complete with a wardrobe and storage cupboards. The bathroom is modern and bright with an extra-large shower cubical. Please note: Entertainment passes can be purchased from the Reception at Thorpe Park. They are not included in the cost of the caravan hire. Thorpe Park Holiday Park is situated in the lovely seaside resort of Cleethorpes. It is perfect for families with children of all ages, as well as adults who want to relax and have fun. The entertainment centre is just a short walk from the caravan. Thorpe Park Holiday Park offers excellent amenities and facilities which include: Large heated indoor pool, 9 hole golf course and family pitch 'n' putt, Lazy river, Flumes & space bowl flume, Children’s play area, Kids’ clubs, Two freshwater fishing lakes, Shows and entertainment, Sports and fun activities, Food, drinks & shops, Water activities, Bike hire; Amusements, Crazy golf; Relaxing walks to the sandy beach. Passes will need to be purchased from reception if you wish to make the most of the on-site facilities. These are not included in the caravan rental price. The caravan is perfectly situated within easy walking distance of the local attractions, amenities and services. Below is a list of some of the great things to do in Cleethorpes. Additional Info: Thorpe Park Holiday Park offers excellent amenities and facilities which include: Large heated indoor pool: 9 hole golf course and family pitch 'n' putt: Lazy river; Flumes & space bowl flume: Children’s play area: Kids’ clubs: Two freshwater fishing lakes: Shows and entertainment: Sports and fun activities: Food, drinks & shops: Water activities: Bike hire: Amusements: Crazy golf: Relaxing walks to the sandy beach. I would like to start by saying we had never been in a caravan before and didn't know what to expect. It's fair to say that Yvonne has set the bar so high I don't know how anyone else could possibly follow! To start with she is so generous with her time and puts in lots of effort to help you decide whether it's a suitable place for you. We came by train so Yvonne sent us a list of cab numbers and was very amenable about arrival time. She also provided things like tea towels and beach things for the kids so we didn't need to carry extra things on the train. We ended up arriving late in the evening having missed our train! Yvonne came to meet us at the caravan and gave us all the information we would need. She'd prepared the rooms so that we could put the kids straight to bed. The caravan was warm and inviting and there was a basket of goodies waiting for us. Everything was spotless and had everything we could possibly need. Lots of little touches that make you feel at home. Well done Yvonne, you do such an excellent job. We've been back home a couple of days now and have told everyone how wonderful you and your caravan are. Thanks again, we'll definitely be booking again. Thanks for the great feedback Sola. You and your beautiful family are welcome back anytime! We stayed the Easter weekend and the booking procedure was quick, easy and professional. All contact was made by Yvonne a week in advance of our arrival including directions. Yvonne very kindly advised that we were able to check in earlier than 2pm. Driving from London we wanted to avoid the busy traffic so got an early start and Yvonne was waiting for us at the caravan on our arrival at around 11am. She showed us how to operate the heating, alarm system, etc and left us to enjoy our weekend. The caravan is well decorated and stocked (including DVDs, books and games) and is set on the sea side so the view from the living room and porch/verandas is superb. She left a lovely welcome basket which was most welcomed after our long journey (particularly by my 5 year old who was also left a sequin art set in the hamper) and got us by until we had settled and managed to go to the shops. The guide book in the caravan was well equipped with all the local information including deals for attractions and takeaway/delivery menus for all types of food tastes. Upon leaving our deposit was returned promptly too. Would definitely recommend this caravan to anyone. Thank you again Yvonne. Thank you for the lovely comments Beverley and for looking after everything.